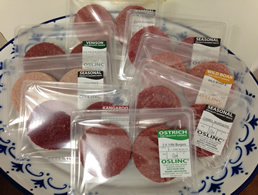 Oslinc | Gourmet Burger Selection (16 Burgers). Gourmet Burger Selection (16 Burgers). Our healthy burger selection is low in fat and high in protein. Includes; Wagyu Beef, Buffalo, Camel, Llama, Kangaroo, Ostrich, Venison & Wild Boar. Homemade in our farm butchery.Every order made fresh and suitable for home freezing.